This is one in a series of books called the Library of Baptist Classics by Broadman and Holman Publishers and is therefore mostly Southern Baptist history but I have found them to be very interesting and encouraging. J.M. Frost wrote and compiled this book in 1900. He was a pastor and long-time secretary of the Sunday School Board of the SBC. 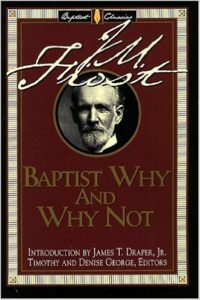 Frost was a prominent figure in Baptist life in the fundamental days of Broadus, Robertson, and Mullins. It is interesting to read these writings of early SBC men and then see what liberal turmoil the Convention went through in the coming century in spite of their warnings and beliefs.